In the year 2032 a trans-dimensional warp has opened up in an old municipal building in the heart of old Manhattan, strange creatures and mutants are seeping through the portal into our world, and they aren't cute and fluffy. The city turns to the lone cybernetic soldier known only as the Chainsaw Warrior, only he has the guts to make it through hundreds of dangerous rooms to the malevolent force that is hoping to destroy the city. The only trouble is he's only got 60 minutes to save everyone from the Darkness before he and his army destroy Manhattan. Chainsaw Warrior is a digital release of the classic 1987 Games Workshop board game that was not only one of the most ridiculously unfair and difficult boardgames that the company developed, but it also stands as one of the very few single player board games available, making it absolutely perfect for a digital release. 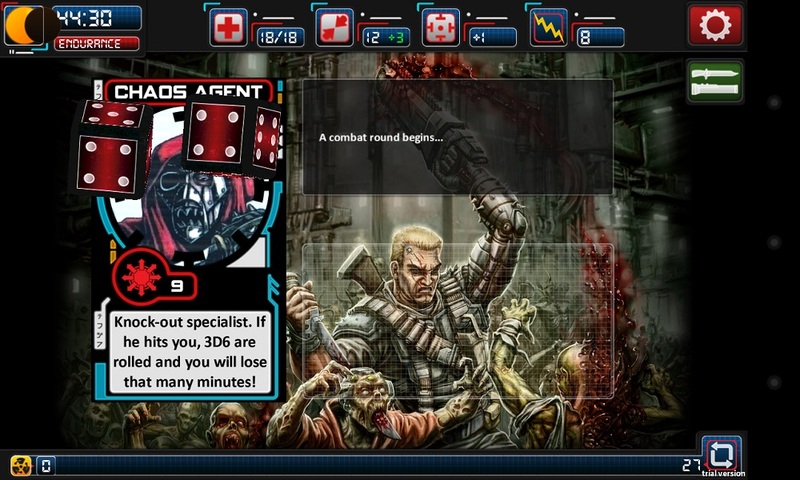 It's important to note that the game has pretty much been left untouched, and what the developers at Auroch Digital have created is literally a digital version of the game, which means you’ll still need to roll your character’s stats, face the penalty of the odd reflex test, keep an eye out for wandering zombies, and turn over each room card as you progress 30 seconds into the game. 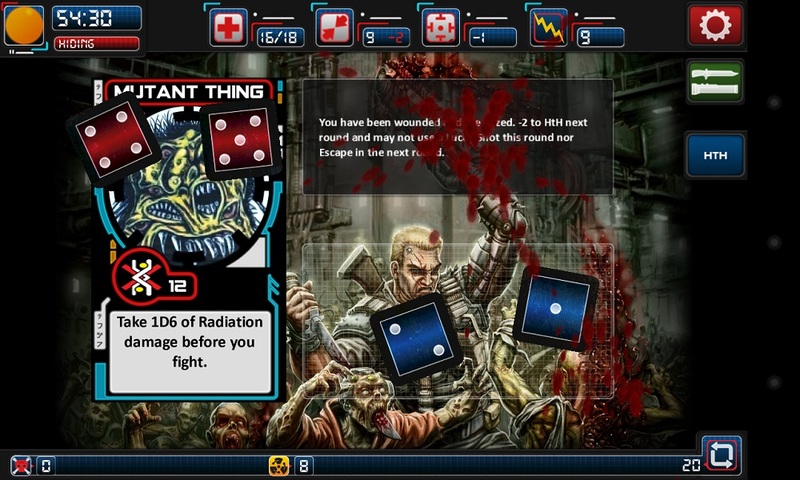 Obviously Chainsaw Warrior will not appeal to those looking for a dumb action shooter, it is inherently a card-based board game at heart, and other than the comic book intro you won't see many dazzling visuals other than the illustrations on each room which are lifted straight from the original cards. Like any great roleplaying game, when you accept the call in the fight against darkness you'll need to create your cybernetic soldier so that he is ready for the mutant onslaught, now this is where the three different difficultly settings are important as they will determine what sort of stats you end up with, if you want to play the game as it is traditionally, go for hard -yes, really!- you need to roll for all manner of stats including endurance, how many wounds you have, your base hand to hand combat attack, marksman skill and reflexes, these stats are your be-all-and-end-all in your fight for supremacy, and believe me, if the dice are not in your favour, you're about to get a tough ride. 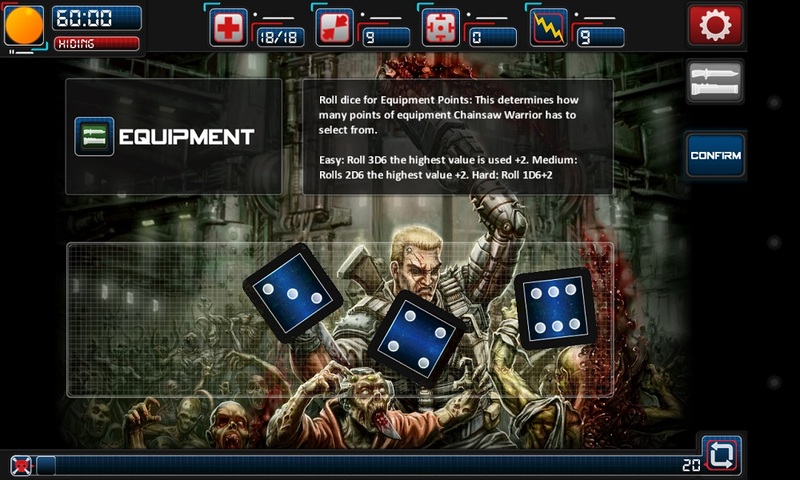 Some may not appreciate the rather traditional style of rolling for your characters stats, but to be fair, in Chainsaw Warrior there's no deadly important stat, they're all just as vital, as each other which means even if you were asked to distribute your own points you'd probably end up with a similar distribution to the luck of the roll. 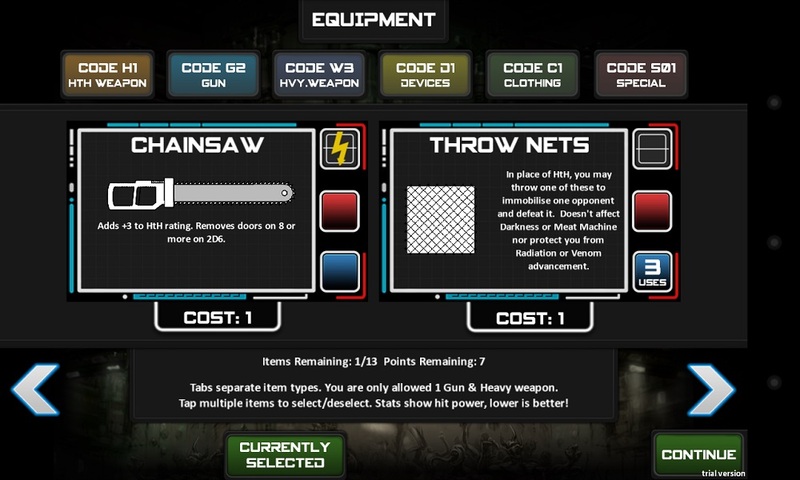 When you begin a game of Chainsaw Warrior your character starts with one very vital weapon; the Laser Lance this is the sole weapon that can destroy the evil Darkness and restore normality to the city of New York, after a roll to practically see how large your pockets are, you can have a peruse of the goods on offer and equip yourself with a variety of perishable and passive objects, there's no such thing as a useless piece of loot in Chainsaw Warrior, and every item has its perks from the IR Goggles that allow you to see in the dark, to the UV Emitter that stops the threat of wandering zombies, you do find yourself spoilt for choice, but after a few games you'll probably have figured out which items you deem the most important. Once you're all geared up and ready for action the hard part is out of the way, the game works with a series of room cards, these are laid facedown and one is turned over at the start of each turn, which takes 30 seconds off of your 60 minute countdown, a room may include a nasty beastie ready to gnaw your face off, or it nay include a trap that may hamper your progress and waste valuable time or it may simply contain nothing. If you do happen to encounter a nasty creature combat will ensue, presuming there are no special stats for the creature you encounter you will have the chance of shooting them before you have to engage in hand to hand combat, shooting at a foe takes into consideration if you can get a shot in quick enough by testing your reflexes, and then get in that all important shot by rolling higher than the enemy's profile on the weapon you're using, hand to hand combat instead uses your HtH stat along with a 2d6 roll, and the same goes for your opponent, roll higher and you get a hit in, luckily enough all enemies have a single wound, but some that you encounter will have unique rules that spawn extra enemies, poison or irradiate you and even outright kill you if they get a hit in. Now you may have noticed that we had mentioned that the original game is one of the most unfair experiences out there, it is, and thankfully the digital version still can be too; centred around a deck of 108 room cards. It is completely up to chance on what room you encounter, creature you face, or trap you fall foul of, but it's one of the absolute charms of the game, you could say I'm a bit of a pro of Chainsaw Warrior, after playing the game at a board game meet up a few years ago, I had to own it, and after many a game, I know which equipment you want to take and the kind of forces you're up against, so let me indulge you in a few new tales with Auroch Digital's version to get you up to speed. In my first game I decided, what the heck, I'll throw caution to the wind, I opted not to purchase the Heat Detector that allows you to discard Lunatic cards, nor did I take the Implosion vest that is the only other item besides the Laser Lance that can kill the Darkness. I'm all set, packed to the teeth and heavily armoured and turn over my first Room card... It's a Lunatic; the Lunatic will steal any piece of your equipment at random, oh look, he's stolen my Laser Lance, the one weapon in possession that can destroy the Darkness and save New York, I was screwed. After admitting a fast defeat I had started a new game, this time armed with backup plans no matter what this twisted warp threw at me, and I do really well, I even get into the second deck of cards, which if luck is not going your way, doesn't happen very often, until I come across a Spiked Pit, testing my reflexes -which were pretty low- I fail and fall down into the spiked pit; not only does this mean wounds, but it wastes fourteen minutes of my time as I clamber back up through the pit -this is determined by the roll of a dice- it's no worry, I keep on going, the Darkness could be in any one of those rooms.. But the timer is counting down, closer and closer and it gets to 00:00 *boom* you didn't save New York in time, game over. Now it sounds pretty harsh, and this was playing on easy mode but there's a resolve, as a gamer that makes you shake it off and walk back into that Tenement, there is no denying that the game is wickedly addictive, just don't be surprised when people don't believe your tales of thwarting the Darkness and saving New York, although if it helps I did kill him with a Lucky Shot in my last game. Chainsaw Warrior is everything you want in a digitised version of the Games Workshop classic, and whether you want to relive fond memories of the boardgame or just experience the most unfair game around, then you've come to the right place, it may not be a reimaging or remake, but it ticks all the right boxes and still manages to keep the frantic, nerve-wracking tension as you hope to god that next card you turn over is not a slime. Chainsaw Warrior is available now on the Appstore for iPhone, iPod Touch and iPad devices for £2.99, keep your eyes open for a release on Android devices, and we'll be sure to inform all you PC gamers when it lands on the best platform around.